The Ekiti State Governor, Ayodele Fayose, has again declared that he would soon emerge the President of Nigeria. The Chairman of the PDP Governors Forum also stated he believes that in the near future, he will take over the mantle to lead the nation as his future was tied to the presidency. He made this known on Monday during a live interview on African Independent Television, AIT. He said, “It is not by power. It is destiny. I did not believe it when I became Ekiti governor after eight years of leaving office. Speaking further, the Governor criticized the embattled national chairman of the Peoples’ Democratic Party, PDP, Ali Modu Sheriff. He said, “He is a general without an army. If democracy is about people and party politics is about people, tell Senator Ali Modu Sheriff to bring out the people behind him. “You will see all the senators at our own meetings, who are those behind Sheriff? “When holding a press conference, they will use camera to control them like this, just about three of them,” Fayose added. 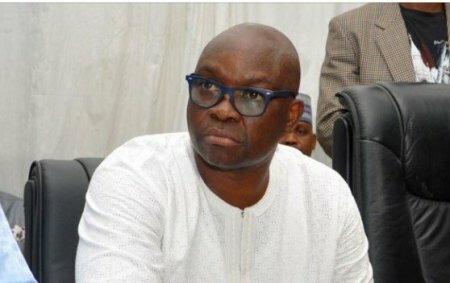 Recall that Fayose, while speaking at an Annual Media Get-Together, held at the Government House, Ado Ekiti on February 4, had declared that he will rule Nigeria as a president in future. He noted that the revelation about becoming a future Nigerian leader was made known to him by God.